Have you been on open house tours and seen beautifully decorated homes and thought, I want my house to look like this!? Many of these homes are staged with furniture and accessories brought in by professional stagers or designers, but some are not. What they all have in common though, is simple concepts that have been used to maximize their appeal, and not with the furnishings alone. You can have your home looking attractive and inviting, and on a daily basis! Clear the Clutter ~ This is the easiest thing you can do, and it doesn’t cost a thing. Have you ever done the run-through before expecting guests? Look at your home with that mind-set, and see what functional items can be put away, and display only the decorative ones. Keep counter tops clear of the week’s mail, bedroom floors free of dirty clothes, and bathroom counters clear of toothpaste tubes and hair products. If storage is an issue, then look for solutions from sources like Organize.com or other retailers. Clearing the clutter will make your home a more calm and relaxing place to come home to! Reduce the Furnishings ~ I see so many homes that simply have too much furniture. Over-stuffing a house with furniture can greatly reduce the flow of your rooms, meaning there’s not a natural, easy progression as you move through the spaces. Many of us have pieces we’ve acquired here and there over the years, and it’s tough to part with them. But, if your house is feeling cramped for space, then maybe it’s time! Walk through each room in your home and make an honest assessment of every piece of furniture, no matter how small it is. Are you using it? Perhaps you are, but is it really necessary? If you removed it, would the room be more spacious and inviting? And the Accessories ~ What applies to furniture, also applies to accessories, and then some! Less is more ~ so reduce the number of accessories that clutter counter tops, dressers and hutches. If you’re a collector, keep your displays concentrated in one area and make them a focal point. Remember the rule of odd numbers when putting your displays together, and err on the side of conservative. Groupings of more than 7 items can get busy and appear like a bunch of clutter, vs. an artistic display. I hope you’ve found these ideas helpful, but if you find yourself needing further ideas, just let me know! I’m happy to help, and my Designer Download© session is a great way to get the inspiration and resources you need to make your home a place you look forward to relaxing in. I could certainly use a bit of this advice. Now I just need some time to do it! Thanka kathy for the inspiration. I love the concept of staging your home for everyday living. Three simple steps for enjoying my home more. I’m on it! The greatest compliment I ever received was just before our house went on the market in Illinois. The realtor came over for our first meeting and after we walked through the entire house (she hadn’t been there since we finished building the house) she asked who we used to stage it!! I was so excited!! As a mother of four I am always trying to keep the clutter out ( I must admit that my husband is worse than the kids) but it is a struggle! I think the mistake people most often make is TOO MUCH FURNITURE!! I have friends ask me for help with their homes often and the first thing I say is “you don’t have to use every piece of furniture you own”!! Scale back!! Not just furniture but accessories and especially CLUTTER!! We’re trying to pull our living room makeover together and these tips will sure help. I’ve never been one for clutter, it makes me edgy. And, it’s more stuff to dust, no thank you! Also, I watch some of those home shows, especially the one where they stage for sale, and they always remove or downsize furniture. It creates a nicer flow and the place seems bigger! You’re right on, once again, Kathy! These are great tips Kathy! I will definitely be sharing this post with my clients. 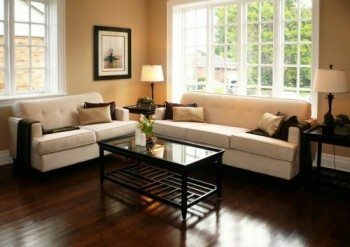 Staging to help a home sell is something that can help a prospective home buyer really visualize themselves living in the home, and with these simple tips many of our clients can do their own staging. This post is great for new home owners too! When people move into a new space they are often so eager to make it their own, they often add too “stuff” up front. Something to consider is when you’re decorating is that you’ll be buying things along the way, so leave space around the house for that special memento you’ll be picking up on your next vacation. This way there is room to grow into the house without it becoming overly cluttered, but still full of love and memories. Thanks again for the great tips! I do agree that less is more. I think one thing that helps me organize house fast is having guests over. Funny how that often works! We pick up accessories when we travel. My husband likes them all out at once. I have finally convinced him that we should have them on rotation like an art gallery. Some out now, then switch them out for others in a few months. Keeps things fresh and uncluttered! I was in the habit of always picking up “stuff” when I was out shopping because I thought I needed them. After many garage sales I’ve stopped! lol Now I only buy things I LOVE and I’ll often pick a picture of a room that I love in a magazine and use that to give me guidance to decorate with what I have. Great post as always! Thanks Kathy! !